Foreign Affairs Minister John Baird and Leona Aglukkaq, minister for the Arctic Council, make public Canada's claim to the extended continental shelf in the Arctic. Foreign Affairs Minister John Baird said Monday that Canada will make a claim to the North Pole, but has not finished the science around its Arctic seabed claim. 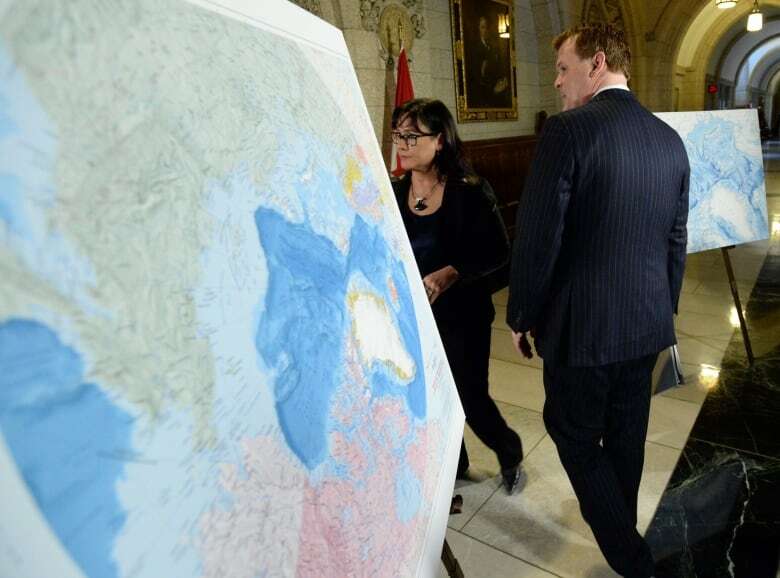 Baird and Leona Aglukkaq, who chairs the Arctic Council, made public Canada's claim to the extended continental shelf in the Arctic, in a press conference in the foyer of the House of Commons. "We have asked our officials and scientists to do additional work and necessary work to ensure that a submission for the full extent of the continental shelf in the Arctic includes Canada's claim to the North Pole," said Baird. The geographic North Pole is 817 kilometres north of Alert, Nunavut, the world's northernmost settlement and home to a Canadian Forces station and Environment Canada station. The ministers explained the country's scientific submission to the UN Commission on the Limits of the Continental Shelf. This submission includes claims to both the Atlantic and Arctic seabeds. There is no extended continental shelf Canada can claim in the Pacific Ocean. While the science on the Atlantic is complete, the government is only presenting "preliminary information" on its Arctic claim. The findings outline Canada's claim to the seabed and undersea bed beyond the 200-nautical-mile Exclusive Economic Zone, which would extend Canada's ownership of natural resources in the area. "Fundamentally, we are drawing the last lines of Canada. We are defending our sovereignty," explained Aglukkaq. At a technical briefing later in the day, experts from Natural Resources Canada, the Department of Fisheries and Oceans and Foreign Affairs attempted to explain why Canada's Arctic claim was incomplete despite years of work and tens of thousands of kilometres of Arctic seabed mapped. "The objective is of course to obtain the most expansive continental shelf for Canada," explained Hugh Adsett, a lawyer with Foreign Affairs who fielded most of the media questions at the technical briefing. Adsett went on to add that they don't know how much more work there is to do and the government is in the process of trying to figure that out. This is in contrast to a paper written by Dr. Jacob Verhoef, Natural Resource Canada's head of Arctic mapping and a participant at today's tech briefing. In the 2011 report, Verhoef enthused about his team's research. "The amount and quality of the data have surpassed our initial hope," wrote Verhoef. "Presently, Canada is on track to prepare and submit its outer limits of the extended continental shelf and substantiating information to the UN Commission by its deadline of December 2013," he added. Neither Verhoef nor Adsett could answer what had changed in the interim. Russia has claims to the North Pole. The submission is part of Canada's responsibilities as a signatory to the UN Convention on the Law of the Sea.